This Workshop Manual is an absolute wealth of information that is suitable for the home mechanic or professional technician. The following is a list of information contained in this Workshop Manual. 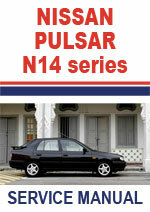 Nissan Pulsar N14 series 1990-1995 Workshop Service Repair Manual $5.99 Immediate Download!